In a very short book, Van Tol has done a great job of telling a story of suspense, of getting into the mind of a crazed killer. Jill is working on a mountain ranch for the summer. It sounded like a great job—riding horses, hanging with other teens. But she finds that what she thought would be her weekly salary is actually her monthly salary. After all, she gets room and board on the ranch, right? And then the other teens, who are great to party with, aren’t so great to work with. After a hard night of drinking, they don’t want to get up in the morning and take the ranch guests out on horse trails. When the son of the ranch owner insists that Jill do more than her share of work while he slacks off, Jill has had it. A man from another local ranch wants to be taken on a wilderness ride, off trail, where the experienced riders go. Jill is so mad that she doesn’t bother to register the guest. She just takes off with him into the wilderness. The problem is that this is no fellow rider from a nearby ranch. He’s a psychopath and his goal is to get Jill far into the mountains and then kill her. He plays a cat and mouse game. Jill knows the area and is a strong rider. But is that enough to get away from a well-prepared weirdo? 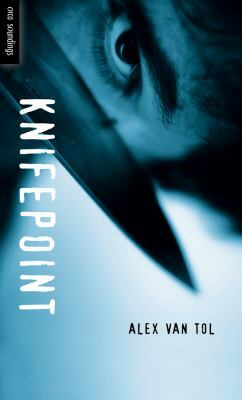 High school housekeeping: Knifepoint is one of the books in the Orca Soundings series and is meant for students working on their reading skills. The Lexile level is 610, so it is somewhere in the 4th to 5th grade reading level. If you are working to improve your reading skills, this is a great choice for a story you won’t be able to put down. This entry was posted in Fiction, Hi-Low/Quick Read, Horror/Mystery/Suspense, Read 180, Young Adult Literature and tagged book reviews, hi-low reading, horseback riding, horses, murder, Orca Soundings Series, psychopaths in fiction, reluctant readers, serial killers, wilderness survival, YA fiction, YA literature. Bookmark the permalink.